Password Protect Mac OS X Apps from Unauthorized Access. Are you sharing your Mac with your family, friends or colleagues? Whether it is Uncle Ted wanting to watch your movie collection or colleague Sam wanting to edit a report on your Mac, or you are using Adium and don't want your children seeing every text message you send and receive. 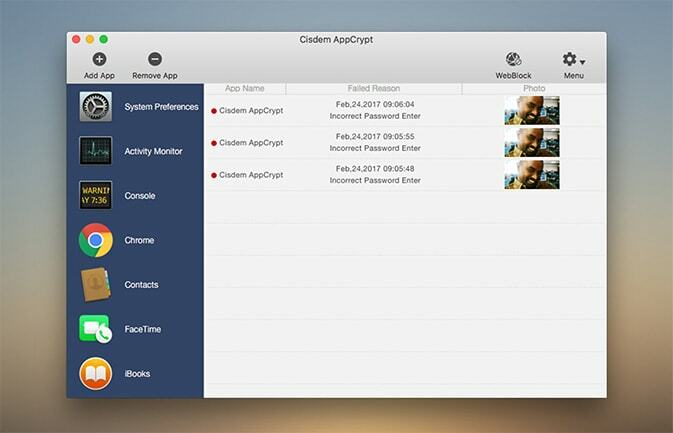 Stop worrying about sharing your Mac with family members, by using Cisdem AppCrypt to password protect individual applications and keep others from playing around with Quicken, Adium or your other Mac apps. You can even limit access to games as well. Have a shared family Mac? Keep the kids from accessing certain apps. You can even limit access to games and video apps as well. Kids, fellow workers, family members, guests – no worries! You pick which apps should be encrypted with a password and AppCrypt for Mac keeps them secure. Today’s users demand wider and more unhindered access with file encryption. There are some App encryption software on the market which help you to encrypt apps by simply hiding the app on your Mac, which is very limiting and complicated. AppCrypt does NOT modify anything in your system settings or applications. It works as a background process and does not use any CPU load while idle. You select which apps get blocked and if you decide to remove the password from that app, simply delete the app from the lock list. Mail, Safari, Evernote, your favorite photo apps, iTunes, Mac App Store and any other apps you use – will be protected using advanced encryption schemes. To keep you covered, we even keep track of failed attempts to access the protected apps – so you'll know when it happened complete with date and time. You can even set it to capture a snapshot of the intruder with the front-facing camera. "I have been a customer of AppCrypt for 2 weeks now, and I can tell you it was well worth the price the company charged for it. I paid it happily because it filled a niche not occupied by other apps. Sure, File Vault is great…if you want to encrypt your whole drive. But if you want to do it on an app by app basis, Cisdem AppCrypt is the perfect choice." "I have been searching for a quick and painless way to password protect apps on my Macbook when I am working offsite. Cisdem Appcrypt is the best App encryption software I have found! The level of options that you can manipulate are unprecedented and allow you to have a record of the intrusion. This thing is freaking awesome, if you like to get away from the office and wish to work on protected apps you are risking a lot without an app encryption software. Keep up the good work!" "I like the way it operates, not having to create multiple text files or to save external files. It's all in the app. Awesome app to secure your OS X Apps!"